Macy’s—the largest largest department store chain in the US—recently published a new infographic demonstrating the impact of Organised Retail Crime on its stores and the wider retail industry. The graphic shows not only the breathtaking scale of ORC, estimated to cost US retailers more than $100 billion annually, but that retail criminals are branching out into a variety of offending methods. 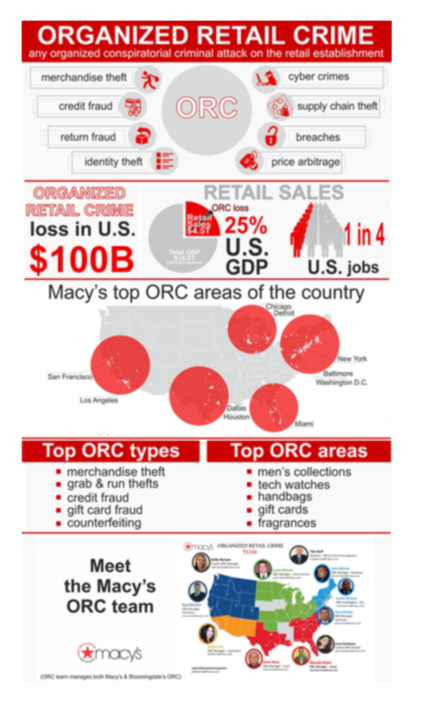 Macy’s notes that the top types of ORC at its stores include general merchandise thefts, but also credit and gift card fraud and counterfeiting. Also noteworthy are Macy’s top ‘hotspots’ for ORC across major metropolitan areas across the southern and northeastern areas of the US. Be sure to check out an interview with Macy's Vice President Asset Protection John Mattas at the NRF Big Show 2017 where he discusses ORC in more detail. Download a copy of the full infographic here from D&D Daily.